My mom made that mushroom. Without meaning to, I took a vacation from the blog. I wasn't doing any cooking or cookbook reading and I got involved in a bunch of other projects and weeks slipped by. I have not cooked since mid-June, when my kids went to New England to visit their grandparents. One night I put steaks in a skillet and turned on the stove to produce dinner for my husband and me. My husband looked at the steak on the plate and said, "No salad!" No. Salad would have meant washing lettuce. Milking Natalie twice a day. Six quarts daily since her babies left. Making cheese with that milk. Have made camembert, taleggio, ricotta, chevre, a tomme that used up 16 quarts, St. Maure, and Neufchatel. That gray matter isn't mold, it's ash, and the cheese is great. I'm getting more confident, getting better, becoming less fearful about experimenting, less fearful about eating the cheese, although there have been a couple of cheeses so monstrous I wouldn't even feed them to the chickens. 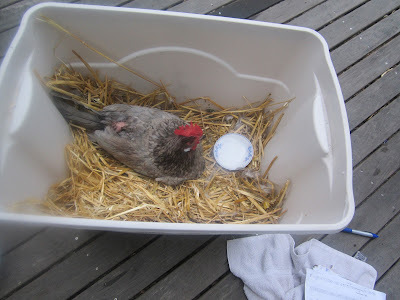 Speaking of chickens, a raccoon killed Sally, the sole survivor from our first batch of Buff Orpington chicks. That was sad. A few nights later, the raccoon came back and tried to kill another chicken, but we ran outside with a flashlight and scared it off. The raccoon slithered over the fence and I went down into the muck and found the mangled bird. I nursed Sprite back to health, although she now staggers when she walks. Sprite used to lay eggs in our kitchen window box. I don't ordinarily like impatiens, but these look like little roses. Which has never looked better! I've revived the garden in a big way. There are now tomatoes and squash, but mostly I just planted or transplanted perennials and citrus trees and vines. The irrigation is finally all in place so maybe this time everything won't die. I want some of the things I do around here to actually stick so I can be living in a functional and adult house by the time I qualify for AARP. No more overambitious plans and half-assed false starts. With that in mind, I finally gave in and bought an Oriental rug. This sounds mundane, but it was a huge move for me. In buying this dirt-camouflaging Turkish carpet, I gave up once and for all the dream that I will ever live in an airy and darling home full of florals and charming vintage white furniture from the flea market. I wasted a lot of years on that pretty dream and it was a relief to let it go. I wish I'd never heard of you, Rachel Ashwell. Now I just need to repaint. 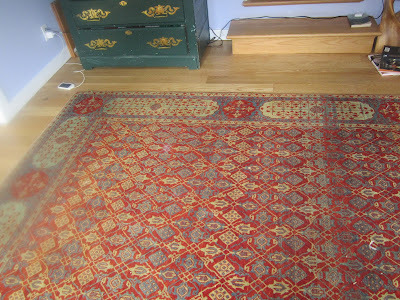 The dark, complicated, quietly vibrant carpet replaces an insipid, totally filthy pink cotton rug which I had come to hate. I am so happy with this rug. I plan to die with this rug. Owen came home a few days ago. It is good to have him back to help with the animals and also because he is nice. Not sure what or from what book, but tonight I am going to cook. So exciting to see your cheese pictures. My boyfriend is making your bagel recipe this very moment and I have just ordered the cultures and rennet to make cream cheese. It will be my first cream cheese experiment and I am very excited. LOVE your book. LOVE. IT. Patti -- Thank you so much. I hope the bagels are delicious. Lookin good! Nothing helps the psyche more than getting that garden under control and a new carpet as well. More on the f'n' racoons later. Bagels are SO delicious-- may eat nothing but bagels today. Also, I'm wondering if we should let them rise more? They were kind of flat and disc like as opposed to puffy. They should definitely be puffy. Often, they become almost unwieldy -- really huge. If your yeast is good and they're not rising all that much, let them go longer. Good to know! I was looking at one of your earlier posts and noticed how big yours were, so I guessed they should be puffy. We will definitely give them another go. Meanwhile, this batch is still delicious. The flavor isn't hurt by their relative flatness and the texture is still bagel-y. There you are! You are usually so prolific, I was actually starting to worry about you a little even though I don't actually know you. I'm glad it was just an unintended vacation! I am making your everday bread recipe as we speak. Worried I screwed up. I kind of just dumped everything in the bowl and tried to smoosh it around. I don't have a bread dough thingy just used my hands. Wish me luck. Ginny and Farm Girl -- I am glad to be back! beyondbeige -- My one big piece of advice -- and it's corrected in the paperback -- is to let the dough rise as long as it needs, not the optimistically short time I specified. That has worked for me in the past, but many people found it inadequate, baked the bread anyway, and ended up with firebricks. It can take hours and hours for the dough to rise. GOOD LUCK! Hey Tipsy! Woohoo. It turned out fantastic! I am so psyched. My husband has had 3 pieces and told me to hide it. You should take as much damn time as you want to give us our (free) blog entries about your adventures. A raccoon got into the coop? How did he get in? I have a tiny Ware coop that had some cheap barrel latches, so we reinforced each entry point with spring hook latches. I think they are critter-proof. Congratulations on your deepening understanding of cheese making. I've got to get back into that. On a chickeny note, I had such luck Friday. Tippie (my favorite hen) had been acting weird for a few days--sitting down a lot, which didn't seem right. Friday morning, at an annual physical at Kaiser, I got a text from my assistant telling me that, due to a power outage, I didn't need to come in to work. I went home instead, discovered Tippie to be much more lethargic and also not eating (even freeze-dried mealworms!) so I took her to a vet that did birds, and she got some antibiotics and seems to have recovered. I'm certain she would have been dead by Saturday if this hadn't happened. Felt lucky all day Saturday. Your garden is very inspiring, especially since mine is sinking under a tangle of bindweed despite my daily battles with it. Does Owen help with the milking? I'm so glad you are back. You were missed, but I thought you were taking a well deserved break since your kiddies were gone. It's good to take the breaks that life offers, since they are often the only ones you get! I am so envious of your cheese. I'm not sure I am brave enough to get that enthusiastic about it, but then I don't have goats either. I have discovered avocado ice cream. Did everyone know about this but me? If that's a vacation, you must be exhausted. We had pepper steak under a brandy cream sauce last night, accompanied by delicious sauteed mushrooms and baked red potato wedges. Glad you're back! Missed you. That cheese looks amazing. Welcome back and love the rug! Where did you find it? Glad to see you're back. I've been checking often as well. Just a quick note on your pictures. Looks like you've got a finger print on the left side of your lens, although as others have commented, not sure why I'd complain about a free blog. Just want you to be your best. And if you take a fantastic picture (like one of your indentured servant with his chickens) you'll want it sharp. :) Love your blog. Thanks. Thank goodness you are back!! I'm most intrigued by your reference to the previous goal of an airy place with white furniture. Still dominates in a lot of circles. If you dare, start reading CotedeTexas blog, and it will spur you on in terms of interiors. Addicting and full of pix and advice. Kristin -- one hen was brooding on a hidden nest so she never came back to the chicken house and the raccoon found her. They range around the yard, so it's impossible to find them if they don't want to be found. The second hen is one of those crazy Spanish chickens who sleeps in trees and she made it 2 years without incident. She learned her lesson. The other night, though, a raccoon tried to get into the house. I think we have a problem. LizA -- One word: ebay.